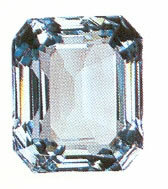 Aquamarine like Emerald is a member of the beryl family. It is named for the resemblance of its color to seawater. Aquamarine is an aluminium beryllium silicate that gets its color from traces of iron. It has a hardness of 7.5 – 8 and a trigonal crystalline structure. When you are feeling discouraged or your work feels empty, aquamarine can find deeper satisfaction and healing in your daily work. Aquamarine teaches you the value of yourself and what you give to others.